Home > Questionnaires > Questionnaire: How Much Do You Know About Waste? These days we’re all trying to do our bit to reduce waste, live sustainably and recycle as much as we can but if you’re really going to do the best that you can, you need to be fairly clued up about a right load of old rubbish – quite literally! There are all sorts of interesting facts, statistics and downright weird snippets of information flying around about the subject – but are they the sort of thing you remember? Do you know your MRF from your MSW, or do you struggle to tell the difference between compost and cardboard? If you’ve ever wondered how much you know about the wonderful world of waste, here’s your chance to find out. The answers are at the bottom – so good luck! 1. Each year we produce enough waste in the UK to fill a lake – but which one? 2. Which of the following accounts for over a third of all of the recycling from English households? 3. What is meant by “co-mingled” waste? a) Mixed general dustbin rubbish. c) A mixture of wet and dry waste. 4. Your council has a new MRF – but what is it, and what does it do? a) Manual Recycling Factor – it’s a way to calculate householder support. b) Materials Recovery Facility – it’s a machine to separate waste. c) Municipal Recycling Facility – a big-sounding name for a landfill site! 5. What is the UK’s current average recycling rate? 6. How much waste does the average British person generate each year? 7. How does that compare with our EU neighbours? 8. Despite internet and TV news, we still seem to get through a lot of newspaper in a year – but how much? a) About 400 kg per person. b) About 40 kg per person. c) About 4 kg per person. 9. On average, how much of the price you spend on an item is the cost of the packaging? 10. How many glass bottles and jars does a typical British household use in a year? 1. (a) it is said that the UK produces enough waste each year to fill Lake Windermere, but fortunately not Africa’s Lake Victoria – which is the size of Wales – or Lake Baikal, the world’s largest lake in terms of volume! 2. (c) according to the Office for National Statistics, between centralised schemes and individual back-garden efforts, composting makes up more than a third of all recycling in England! 3. (b) co-mingled waste is mixed dry recyclables, usually left out for collection in a single box. 4. (b) it’s a Materials Recovery Facility and it helps separate the recyclable elements in waste. 5. (b) as a rough average across the UK, we recycle around 25% of our waste – although individual areas obviously vary a lot and different estimates put the figure a little higher or lower depending on how and when each individual survey was conducted. 6. (b) we produce around 600 kg of waste per head of the population annually. 7. (c) it’s about the same as the European average. According to the most up to date information, the actual figures for the UK are 592 kg per person, with the EU average being only 15 kg a year lower. 8. (b) the typical Briton gets through nearly 40kg of newspaper a year. 9. (b) packaging accounts for some 16% on average of the cost of an item – and usually ends up in the waste stream. 10. 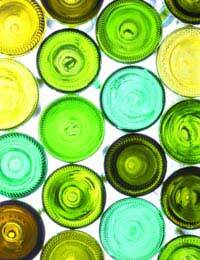 (c) 500 glass bottles and jars cross the threshold of the average UK home every year. So, How Did You Do ? 6 to 9 – Sustainable! 3 to 5 – Co-mingled! 0 to 2 – Rubbish! I think everyone should recycle to save our plant peace to all you tree huggers out there!